Yes we kept the name of June but added bug to it. Her name is June Bug. She is adjusting well and every day it gets better and better , she seems to be very happy. At times it even looks like she has a smile on her face. She loves when we go outside and loves to be chased. She does the pug run, tucks tail and rump down and away she goes. She is now walking on all types of floors. We are now working on steps, and having a collar and leash on so we can go on walks. She is just a joy and we love her very much, I hope we can erase all those bad memories away. We know that she will be giving us so much joy in the years to come. 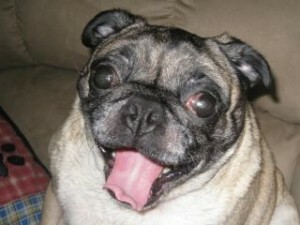 I just want to tell you how much we appreciate all that you and everyone at PPN do for these pugs dogs. You are the angels that rescue them and give them a chance at a happy life . I hope and pray that all the pug dogs find there furever homes.